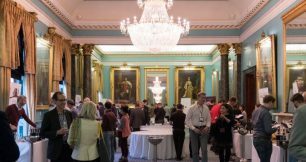 Following on from the success of Maisons Marques et Domaines’ 30th Anniversary Tasting last year, the Fine Wine Importers held its Annual Portfolio Tasting on the 25th January at the Institute of Directors with strong attendance from customers, press and the trade. Guests had the opportunity to sample new vintages, including Louis Roederer’s Cristal 2009 and Brut Nature 2009, and the Castillo Ygay 2007 from Marqués de Murrieta to name but a few, and revisit old favourites. Tasters also used the occasion to discover new wines from Domaines Ott*, Marqués de Murrieta, Castello Di Fonterutoli, and Belguardo. Richard Billett, Managing Director of Maisons Marques et Domaines said: “We were delighted to welcome so many of our trade customers and friends from the press to our Annual Tasting at the IoD last week. The event, which in many respects launches the year for MMD, is always a great opportunity not only to showcase new wines and new vintages but also for our customers and producers to engage, reflect on the previous year and more importantly look forward to the year ahead. While we expect 2017 to not be without its challenges, the sense of optimism and upbeat atmosphere throughout the day was particularly encouraging”. In addition to the vintages on offer in the main tasting, a select number of guests enjoyed a masterclass on the Super Second Chȃteau Pichon Lalande Masterclass lead by Nicolas Glumineau, Managing Director and Cellar Master of this prestigious Pauillac Chateau. Those who attended had the opportunity to taste Réserve de la Comtesse 2012, 2011 and 2009, as well as Pichon Longueville Comtesse de Lalande 2012, 2009, 2003, 1996, 1995 and 1985, with commentary on the development of the wines, as well as an insight into the future of the Louis Roederer owned property. Contact Kate Lofthouse for more details.